U.S. consumers are paying down debt, but their also returning to their credit reliant ways, according to data from the New York Federal Reserve.The data suggests that, while the mortgage debt problem is stabilizing, consumers, now more confident in the U.S. economy, are spending more on their credit cards. 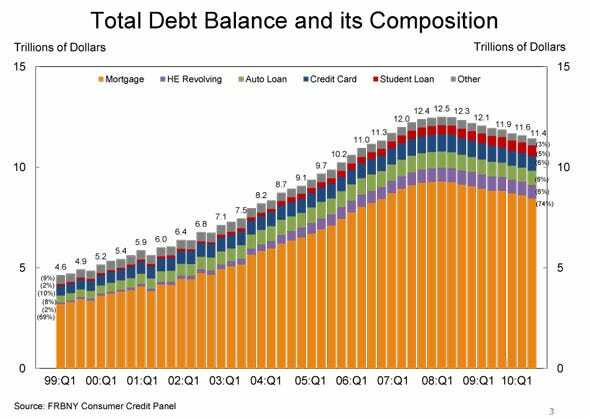 There is also a continued rise in student loans to monitor. It shows clearly how student debt has risen over the past few years. If you’re looking for a quick brief on where the U.S. stands in its deleveraging and re-leveraging cycle, don’t miss these charts. 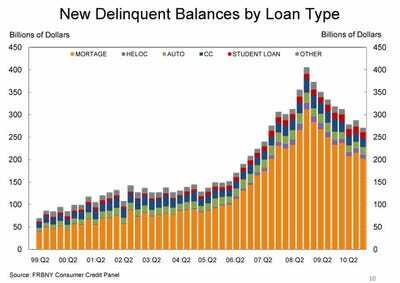 New delinquencies continue to trend lower, including mortgages. 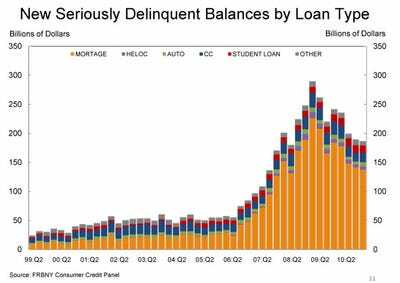 Seriously delinquent loans are a bit more stable. 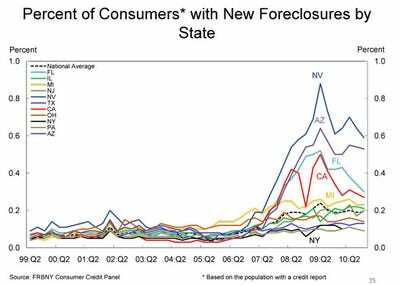 New foreclosures are largely down, excluding Pennsylvania and Michigan. 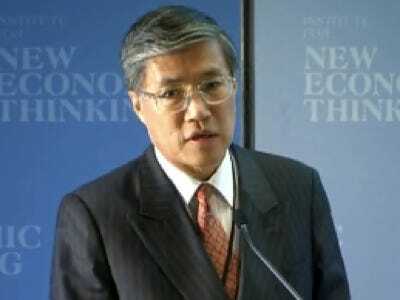 Debt overall is in decline, or stable. 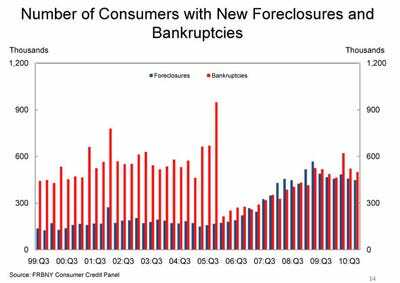 After jumping, new foreclosures and bankruptcies have fallen back in line. Mortgage's share of consumer debt is steadily decreasing, while other components rise. 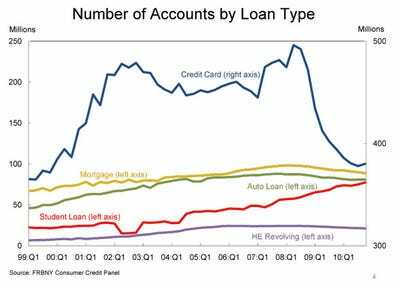 Note, the recent uptick in credit card accounts and the continued rise in student loans. 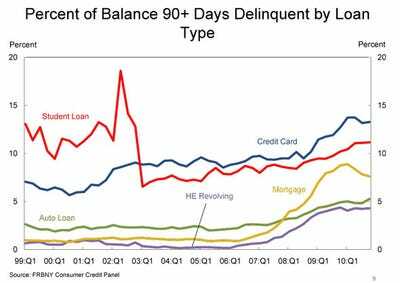 Student loans, credit cards, and auto loans continue to see delinquencies increase. 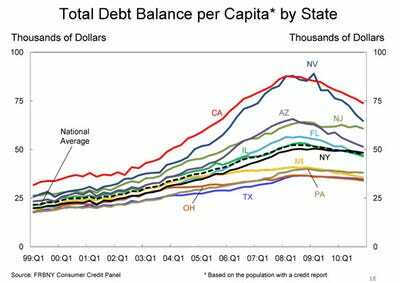 Worried about the U.S. consumer debt problem?